The majority of the nearly 1,700 kittens admitted to the ASPCA Kitten Nursery in 2018 arrived without their mothers, including a quartet of siblings found in Brooklyn, New York by a Good Samaritan just before Halloween. 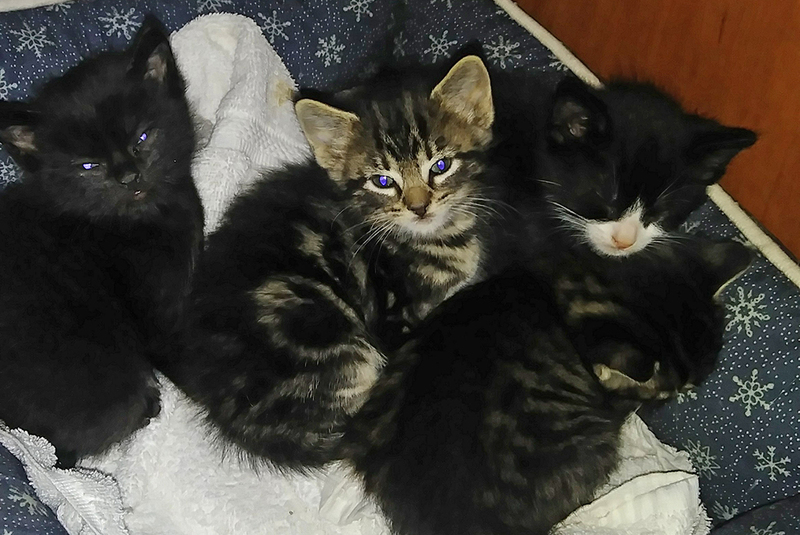 Fittingly named Spooky, Drac, Skelly and Wolf, the kittens were earmarked for a foster home but remained in the nursery because they weren't successfully latching to their bottles. Days later, the same Good Samaritan found a cat he believed to be the kittens’ mother, presumably searching for her missing litter. At the ASPCA Adoption Center, the mama cat was named Elvira for her black “mistress of the dark” looks. She was then examined and taken to the Nursery to be reunited with her babies. 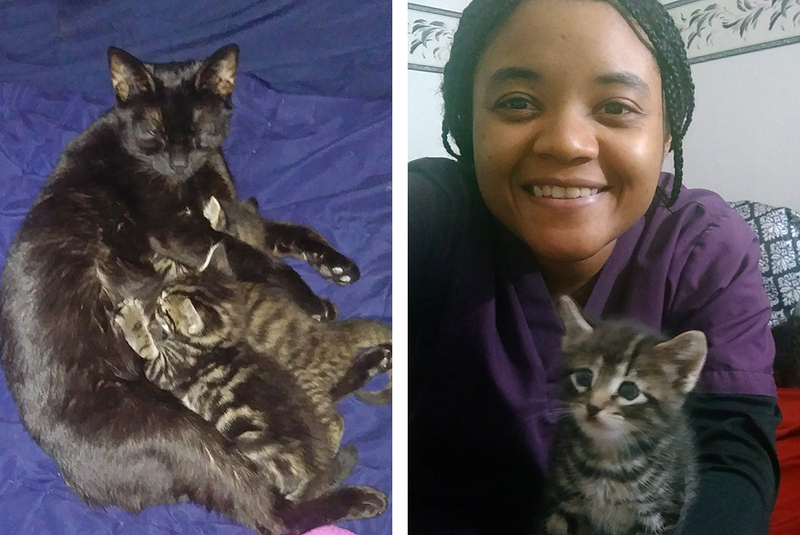 After letting Elvira settle in, Nursery Caregiver Alex Esheyigba brought one kitten at a time to her until all four were successfully introduced. Elvira soon took to nursing the foursome, all of whom were too young and underweight to survive without intervention. Finding their mother likely saved their lives. “If you find kittens, it’s best to wait and see if the mom returns,” explains Gemma Smith, Administrative Manager for the Nursery. “Kittens may be orphaned because their mother was killed, injured or unable to care for them. Sometimes they’re removed by well-meaning people while the mother is temporarily away. Smith advises people who find young kittens and don’t spot a mother to call their local shelters first to see if and how they can help. The ASPCA Kitten Nursery has caregivers on staff 24 hours a day, seven days a week between April and October, as well as foster volunteers for healthy kittens who only need feeding and minor medical care. That’s where Zina R., an ASPCA foster, came in. Zina agreed to take in Elvira and her babies and shuttled them to her apartment. For the first week or so, Skelly and Wolf did well on their own with Elvira, according to Zina. However, because Drac and Spooky tugged too much at Elvira, Zina bottle-fed the duo at night. During the day, while Zina—a medical assistant at a local hospital—was at work, Drac and Spooky were fed every two to three hours by Zina’s sister. 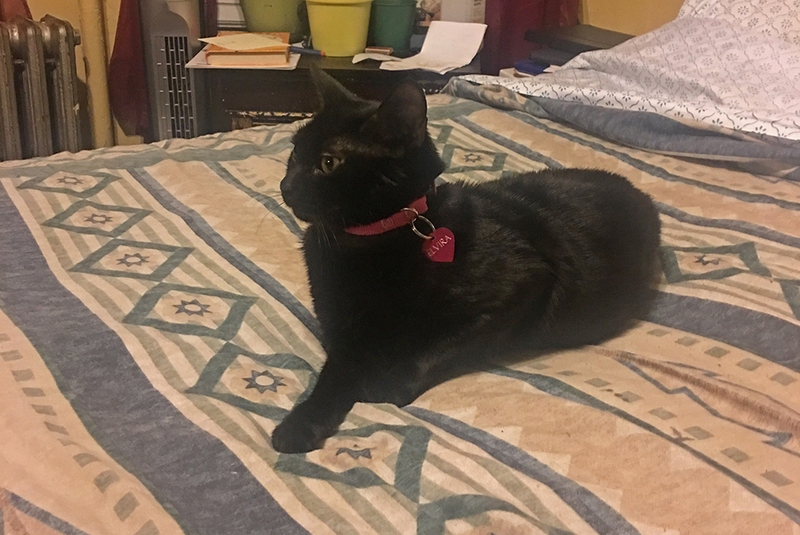 Zina has been a foster volunteer for a year and has taken in four litters without mother cats—also called queens—but Elvira was her first experience with a mama cat. Zina returned the kittens—and Elvira—just before Thanksgiving, when they were old enough to be spayed and neutered. The kittens were adopted quickly, and just before Christmas, Elvira was adopted by Gloria D. during a visit to the Adoption Center with her eldest daughter, Jennifer. True to her name, Elvira is a night owl, often sleeping during the day and playing mischievously at night. And she’s still a leg-climber. A happy ending for Elvira, who saved her family’s life and was rewarded with a brand new family for herself.